I spent the weekend working at the Homebuilding & Renovating show at London's Excel centre. By way of relaxation, I often walk the neighbourhoods surrounding these venues both before and after showtimes. Excel is situated next to the Royal Victoria Dock in the heart of London's East End and co-incidenatlly, very close to the site of Ronan Point, the ill-feted tower block which partially collapsed shortly after it was completed in 1968. The story of Ronan Point has been well documented and there is much on the web about it all. Five people died after a resident attempted to light her gas stove early one morning and instead caused a gas explosion which blew out her kitchen wall and this caused all the kitchens above and below hers to collapse. Whilst the number of deaths was a tragedy for all concerned, this part of London had been well used to explosions having been witness to some of the most intense bombing in the Blitz, not to mention the largest explosion ever to be recorded in London at the Silvertown TNT plant in 1917. 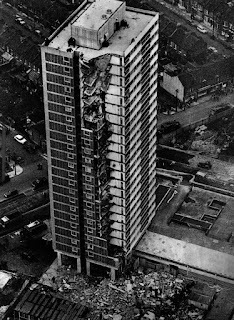 The Ronan Point collapse is remembered now not for its death toll but for the way it marked a turning point in the history of housing in the UK. The 1950s and 60s were a time when Britain went a-housebuilding in a way that has never been seen before or since. Many of the big cities were still bomb damaged after WWII and what remained undamaged was in very poor condition and was widely regarded as little more than slum dwellings. So London's East End was being cleared of existing Victorian housing stock and grandiose schemes of cities in the sky were being enacted. Corbusier's dream of tower block living was coming to fruition here in Canning Town. However, the dream and the reality turned out to be poles apart. By 1968, tower blocks were being thrown up in record time using pre-fabricated walling systems and, as it later transpired, very low build standards. Only when the boffins came to examine Ronan Point after the explosion did they realise just how poorly these blocks were built, and that it was surprising that more didn't suffer a collapse similar to Ronan Point. Part A of the building regs was in large part re-written because of what was learned from Ronan Point. The disaster marked a turning point in the story of the slum clearance policies and council house replacements, as well as sounding the death knell for council tower blocks. The dream died with the collapse of Ronan Point. The enthusiasm and vision of a brave new world, built high in the sky, was quietly abandoned with the realisation that this was no way to house people. 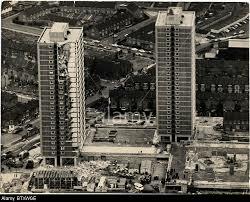 When the entire Freemasons Estate (9 identical tower blocks of which Ronan Point was one) was eventually demolished in the 1980's, it was pointedly replaced by low rise terraced housing, built by Barratts. Only now, in the 2010s, has tower block building returned to fashion. The Docklands Light Railway which cuts through this area is now a great vantage point from which to witness the return of high rise flats in this part of London. Let's hope it ends rather better this time than it did in Canning Town in 1968. I was intrigued to see what evidence of Ronan Point there is today so I went exploring along Butchers Road, E16, to see if there is any indication what happened there one May morning nearly 50 years ago. Alas, there is no plaque, no memorial, not even a storyboard to explain the significance of this place to residents and visitors. It's an important piece of our history and it's being completely ignored. Some might feel that to be interested in Ronan Point is a little ghoulish, but after half a century almost all the immediate actors in the event will have passed on, and it's an important event in the history of 20th century Britain. It still has resonance. In fact, it took a little detective work on my part to work out just where the Ronan Point tower had once stood. There were lots of aerial photos taken after the explosion, but this doesn't make it easy to place it because many of the surrounding streets have been rebuilt, often with new alignments. But there are one or two key photos on the web which, together with other useful bits of information, place the tower block exactly. None more so than the one which shows the address of Ronan Point as 85 Butchers Road. There are others in which you can make out the side streets, Ashburton Road and Fords Park Road, to the west of Butchers Road, which still follow the Victorian street pattern. Butchers Road is the street that runs diagonally across the image below, from bottom left to top right. 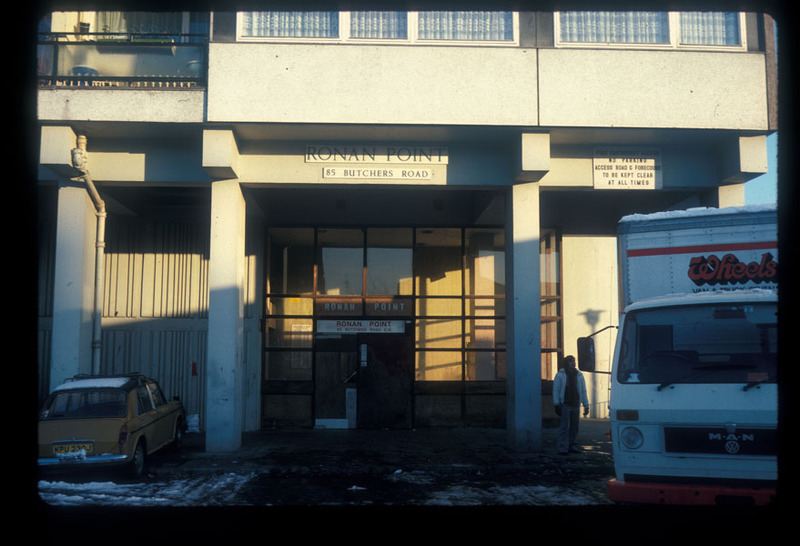 And there is the recorded fact that the site , after demolition, was developed by Barratts in their inimitable 1990s Noddy-style, complete with GRP porch canopies. It's these Barratt houses, arranged in two terraces stretching between Butchers Road and Freemasons Road, that mark out the surprisingly small footprint of the Freemasons Estate. Ronan Point was the westernmost tower. 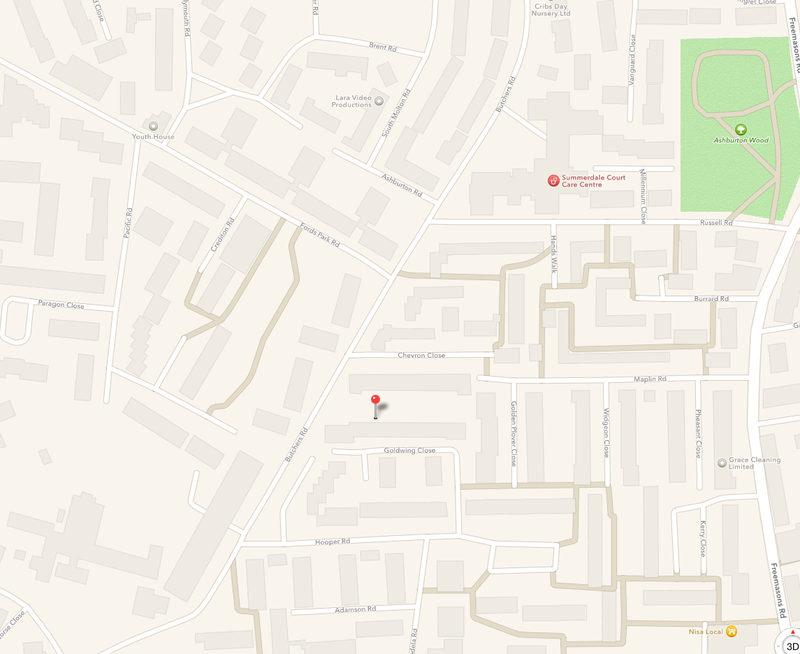 In fact, there is still a No 85 Butchers Road, which marks the entrance of the only Barratt home to face Butchers Road itself, just to the south of the Butchers Road Newsagents. That, near as damn it, was where the tower once stood. I you are interested in finding out where it happened and, en route, getting to see a fascinating if still deprived part of the East End, the pin on my Google Map marks the spot. It's a 15 minute walk from the Custom House DLR station and an easy side tour for those visiting Excel. Here are some mood-capturing images I snapped from my iPhone last Sunday morning. The newsagent is just to the north of the site. Ronan Point would have once towered over it. 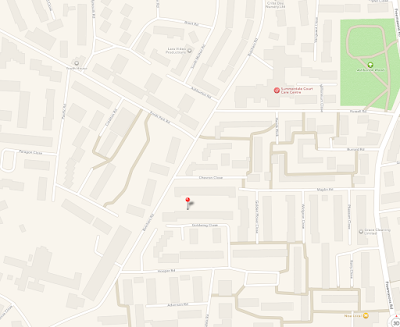 The electricity sub station is on Butchers Road by the entrance to Goldwing Close. It's very close to the site of Ronan Point. This Barratt house on Goldwing Close is more or less on the spot where the tower stood. These houses are now 20 years old and they haven't aged well. Selfbuild can be a slippery concept. It has a definition which seeks to differentiate it from other kinds of build: it's that the project is conceived and executed by people for their own use. But is that in itself exceptional or noteworthy, and does it justify the amount of column inches that get spent lauding selfbuild as if it's the answer to our housing problems? Probably not. This question is asked in the latest piece of academic research which has been carried out by Michaela Benson, a Senior Lecturer in Sociology at Goldsmiths in London. It's not often that academics turn their attention to selfbuild. In fact you can count the number of serious attempts at analysis on the fingers of one hand so it's always interesting to hear what they make of the selfbuild industry. 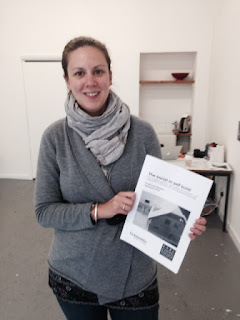 As with others before her, Michaela Benson struggles with the very individualistic nature of selfbuild which makes conclusion-drawing problematic. But she does have one or two insights that are fascinating. One is that, of the 16 selfbuild stories she puts under the microscope, they all have problems reconciling their budgets with spiralling costs and that they all seem to run into financial stress at some point. She concludes that selfbuild mortgages aren't all they are cracked up to be, as the fronted sums never seem to be enough to meet the bills. And related to all this, there is almost always some sort of falling out with professionals encountered on the journey. Architects can go from hero to zero in the face of unforeseen cost shocks. Contractors fall by the wayside as timetabling slips hopelessly. Specialist suppliers screw up badly, throwing the project timetabling into disarray. New techniques and technologies are embraced by the selfbuilders but often flummox the contractors. People met along the way often promise much but deliver little. But she also concludes that these problems are not unique to selfbuild. In fact they are pretty much endemic to construction, certainly as widely practiced in the UK. Apart from a small number of community-organised schemes (which receive a disproportionate amount of media interest), selfbuild in England is a very middle class affair, taken on by people with good education, substantial earnings and/or assets and usually with some experience of management. In other words, the privileged few. That they so frequently run into problems probably says more about the chaotic nature of construction that it does about their own inadequacies. To be fair to the selfbuild media, these conclusions are hardly a surprise. In fact this narrative lies at the heart of most episodes of Grand Designs. Plucky couple take on taxing project at considerable risk to their wealth and health; after facing many hazards along the way, they emerge bruised, battered but triumphant. Benson's research more or less confirms this stereotype. The one conclusion that she draws from her study that is perhaps unconventional is a call for individual selfbuilders to better manage the social relationship side of their jobs. When the relationships break down, the job suffers and the cash management goes out the window. Which is perhaps an academic way of saying try and keep people sweet. I am reminded of a couple of selfbuilds I have written about where the selfbuilders puts an enormous amount of effort and quite a bit of cash into keeping subcontractors on board. One arranged to have the fish and chip van arrive on site every Friday so that everyone working there got a slap-up lunch. Amazing how often this resulted in a full crew turning up every Friday. The other tipped his subbies over and above what their gaffer was paying them. He ended up tipping over £1500 in total, but reckons it was money well spent, as standards were excellent and there were very few callbacks. People respond to generosity, and goodwill gestures are often good investments in themselves. Micahela Benson's report, The Social in Selfbuild, is officially launched on Friday 18th September at the Geffrye Museum and will be made available via her online blog later that day. On Sunday evening last week, I set off to cycle across Cambridge to have supper with Mandy, my partner. As I passed along Trinity Street, ahead of me I spied a crowd assembling outside Great St Mary's Church, the historic heart of the city, just across the street from King's College Chapel. I had no idea what was going on but as I slowed down to pass the throng, I saw a man (Richard Murphy, no less) standing on one of the stone benches outside the church talking through a loud hailer. And next to him stood none other than Jeremy Corbyn, who seems in this week in September 2015 to be very much the man of the moment, as he stands on the verge of winning the Labour Party's leadership election. Corbyn had been booked to talk inside the church that evening but the meeting had sold out, so he had decided to do an impromptu talk outside beforehand. A "dress rehearsal", he called it. So naturally curious, I parked up my bike and decided to see what all the fuss was about. Murphy was batting on about the Peoples QE which sounded to me (not exactly a left-wing firebrand) like he just discovered that money does grow on trees after all. "No need to have any austerity, we can just print some money. They did it for the bankers, we will do it for ordinary people." But such has been the extraordinary economic landscape of the past few years that this left-field approach no longer seems quite as batty it would have done ten years ago. Murphy stood down and up pops Corbyn to a big round of applause - there are maybe 150 people gathered around outside the church The setting is quite surreal. It's a beautiful evening in the heart of a beautiful city: the sun is setting, giving the surrounding stone buildings a lovely warm reddish glow. 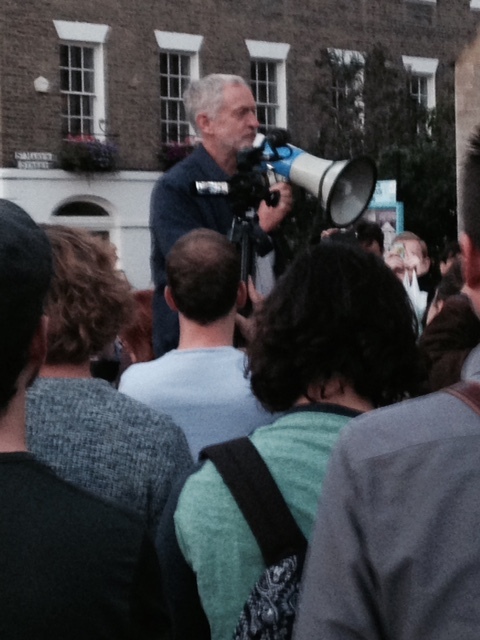 And there is Corbyn chatting to us like we are a bunch of students on a camping expedition. He comes across like a keen young teacher — some might say overgrown student — talking with us rather than at us and talking very much from the heart. Initially I am totally dispassionate (being naturally cynical and only a little younger than Corbyn), but I soon find myself warming to him. In fact, after about three minutes I give up resisting and decide that he is actually a very cool guy, very natural and easy with his words and very charming too, in a self-deprecating way. It's one thing to be self-deprecating person-to-person, it's quite another to be able to do that on a public platform and not sound smarmy. Corbyn didn't sound at all smarmy. He might not appreciate this plaudit, but he came across as a real gentleman. He spoke for about 20 minutes and only referred to a handful of people in that time. One was Peter Mandelson: he rubbished his "I'm comfortable with people making lots of money" quote. Corbyn said he wasn't at all comfortable with it and noted that FTSE directors earn 187 times more than their lowest paid staff. All good 70s radical stuff here, but maybe, just maybe, it rings truer today than it did back then. Then a strange thing happened. He started talking about the cuts to the health service and social care and referenced a successful campaign to save wards at the Whittington Hospital in Islington, Corbyn's home. This is all good grass roots activism of the kind I grew up on in the 70s but it seemed miles away from the high offices of state that Corbyn is now standing for. He mentions that he had had a recent conversation with one of the principal organisers of this campaign, Shirley Franklin. Shirley who? No one in the audience would expect to know who the hell Shirley Franklin is. Except that I happen to know her personally, as a friend of a friend and someone we did building work for in the 1980s. How bizarre is that? I'm listening to a man making a pitch to become leader of the Opposition and and he's chatting about someone I last saw at a funeral a few years ago. It felt like I was now sitting in his living room having a chat about the neighbours. Not that Shirley isn't interesting in her own right. As niece of the esteemed Rosalind Franklin, the unsung co-discoverer of DNA, she has many interesting stories to tell. But this evening in the dappled sunlight of Cambridge churches and colleges, her mention made it a very personal connection for me. As Corbyn stepped down to move onto the main business of his evening, talking in the church itself, I returned to my cycle and pondered on what I'd heard. If he does win the election, there will be a lot of people out to attack him, many of them from his own party. They may yet make mincemeat of his all-too-idealistic policies, but I suspect they will find it hard land a blow on him for being inconsistent or corruptible. Or boring. Old Labour he may be, but we have long since tired of the New version, so it will be interesting to see how Britain fares with a genuinely different political creed to debate with once more, even if it is a case of dusting off the 1970s agitprop.